WineScribble is headed out to a winter BBQ today and carrying a bottle of rosé wine. 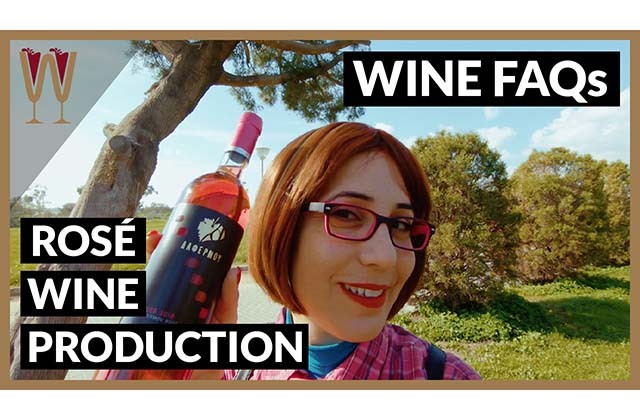 Which prompts a quick discussion in the park of the 4 main types of rosé wine production methods including limited skin maceration, the Saignée Method, Blending and the controversial decolourization method. Sorry about the wind noise! Mental note: no more GoPro microphones in the park. Hey Tasters! There are two camps when it comes to rosé. Some of us think of it as a wine strictly to be enjoyed in the summer, many however love tasting rosé all year long. But, did you know that rosé wine can be produced in a variety of ways? I live in Cyprus and here the Sun is out all year long. So, I’m headed to a winter barbecue today and I’m taking this bottle with me. The most popular method of rosé production is limited skin maceration. The colour of wine comes from the grape skins not the juice. Skin contact, or maceration, is essential for any wine that is not white, and after crushing the grapes the juice is left to macerate with the skins so that colour, flavour compounds and tannins can be leached from the grape skins. This is exactly how red wines are made too. Because the difference is that in the case of rosé wine skin contact is limited to just a few hours. Also, in fact maceration time for rosé wines usually lasts from 12 to 24 hours. Maceration can be as short as 6 hours but rarely lasts more than 48 hours. Therefore, it is the length of maceration that determines the colour and flavour intensity of the final product. The longer the juice and skins are left to macerate the deeper the tint of pink in the wine. At the end of the maceration, the rose-tinted juice is drawn off the grape skins and fermentation begins. This method is versatile, and depending on the type of grapes and the length of skin contact a variety of rosé wines can be produced. Another popular method of rosy production is the ‘saignée’ method. This literally means ‘to bleed’. It involves bleeding off, and that is removing, some of the juice from the must of a red wine. Because, this helps concentrate the flavour and aroma compounds in the must, as well as deepening the colour of the red wine. This method has been very popular in the wine regions of Bordeaux and Burgundy. However, the primary goal of this method is to produce a superior, more intense, red wine. Although it is perfectly possible to produce rich and even award-winning rosé wine using the saignée method, some wine experts strongly object to its use in rosé wine production. For example, in 2012 François Millo, president of the Provence wine council, made the case that rosé wines made using the saignée method are not true rosés because the vintner is focused on the red wine rather than the rosé. The third method is controversial and it’s called blending. Winemaking is not as simple as watercolours. So, although blending a little red wine into white wine would give you pink wine, this is not deemed good enough to be called a rosé. At least not in the European Union. In fact blending wines post fermentation is strictly prohibited, especially if the wines in question fall in the PDO, or Protected Designation of Origin category. Also, winemakers and wine lovers in the EU feel very strongly about this. In 2009 the European Union caused an outcry by proposing a legislation change that would allow winemakers to create a rosé wine by mixing red and white wines post fermentation. However, this proposal was received with strong protests all over France, but most notably in Provence where the vast majority of wine produced is rosé. Also, strong objections were raised in Italy where Rosato is very popular. The proposed legislation change was abandoned. There is one notable exception to the rule when making rosé. In champagne blending red and white wine post fermentation is not only allowed but recommended. Last, and definitely least, is the decolourization method. This method of producing rosé wine involves the extreme discolourization of red wine. This method involves using a purified form of charcoal that is capable of absorbing colour and other flavour compounds from the wine at a high rate. The red wine is passed through a system of charcoal filters until the desirable shade of pink is achieved. This method is useful if a wine maker is stuck with a red wine that won’t sell. However, as you can imagine this method does not just discolour the wine. It also indiscriminately strips off the colour, flavours, aromas and character. This method is never used in the production of a good quality rosé wine. Right guys I’m nearly at my friend’s house, I’m gonna have to let you go now. I hope you’ve enjoyed the video, tasters. Had your heard of all these rosé winemaking methods before? Comment below and let me know. Or, just leave me a comment and let me know what your favourite rosé wine is. Leave a thumbs up and share this video with a friend. Cheers everybody. Have you subscribed yet? Go on hit the red button below. 1. Cork vs Screw-cap: Why don’t all bottles have screw caps? 2. Wine Label Information: Which label is the front wine label? 3. The Wine Bottle Dimple: Why is it there? 4. Histamines in Wine: Everything you need to know! Ask the Somm: How is Rosé Wine Made?